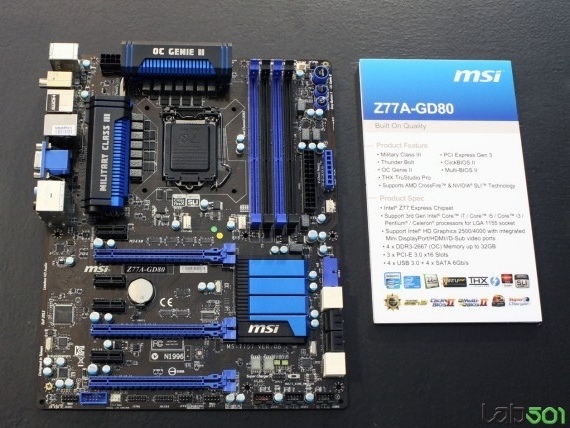 MSI recently announced the availability of the new MSI Z77A-GD80 motherboard with Intel Thunderbolt technology. With MSI’s true integrated Thunderbolt design you don’t have to worry about losing bandwidth or placing additional add-in cards as it is the most simple Thunderbolt solution available. Of course, the renowned Military Class III components are again available to deliver the highest quality and most stable components. OC Genie II boosts your overall CPU, Memory, Disk and Graphics performance and thank to its power saving hardware features such as Active Phase Switching (APS) and DrMOS II, the MSI Z77A-GD80 can combine its CPU performance with best power saving. MSI equipped the Z77A-GD80 with the groundbreaking Thunderbolt technology. Thunderbolt is the fastest data connection available for your PC, running at 10Gbps. Thunderbolt technology delivers two communications methods, or protocols, on a single cable: PCI Express for data transfer and DisplayPort for displays. MSI has integrated the Thunderbolt controller on the motherboard, ensuring that Thunderbolt is a hassle-free solution that not requires additional cards, cables and configuration issues because external Thunderbolt controllers steal bandwidth from other devices. 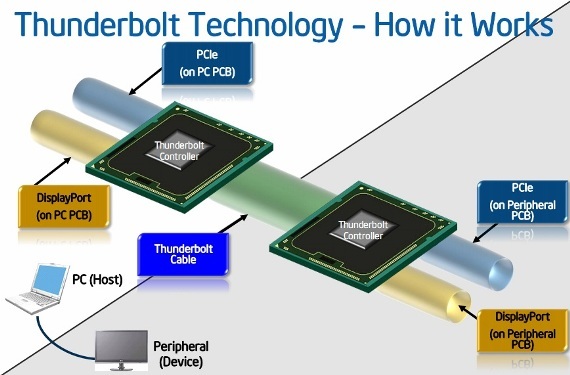 Thunderbolt is an easy technology and should not add to your PC complexity! Data transfers for backup, sharing, and editing are faster with Thunderbolt technology, significantly reducing times to complete these tasks. Running at 10Gbps, Thunderbolt technology on the MSI Z77A-GD80 can transfer a full-length HD video in less than 30 seconds and backup 1 year (!!!) of continuous audio playback in just over 10 minutes. Intel Thunderbolt technology delivers great responsiveness with data and display transfers – in each direction, at the same time – using a single cable to connect devices. It’s no longer needed to connect multiple devices directly to your PC. Using multiple connection in a daisy chain, the amount of cables directly attached to your PC will be reduced while maintaining maximum throughput. 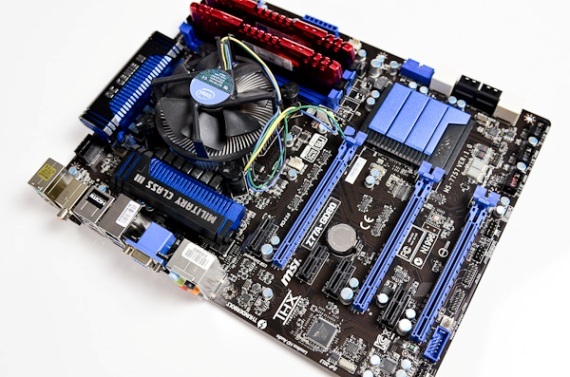 The MSI Z77A-GD80 is equipped with Military Class III components. consistent of the new DrMOS II next-generation MOSFET with double thermal protection ensure safety while providing the highest efficiency and power output. Hi-c CAPs have very high efficiency and small form factor, ideal over overclocking or over-sized CPU cooling. Super Ferrite Chokes (SFC) are more powerful and more efficient than Chokes employed on other motherboards and the all-solid capacitors are the backbone of any long-lifetime product. MSI OC Genie II is world’s easiest overclocking technique and allows a complete performance overhaul with a simple push of a button. My OC Genie is a new feature that allows end-users to customize their OC Genie II experience through MSI’s unique ClickBIOS II interface. MSI Z68A-G45 ATX Motherboard Coming Soon!